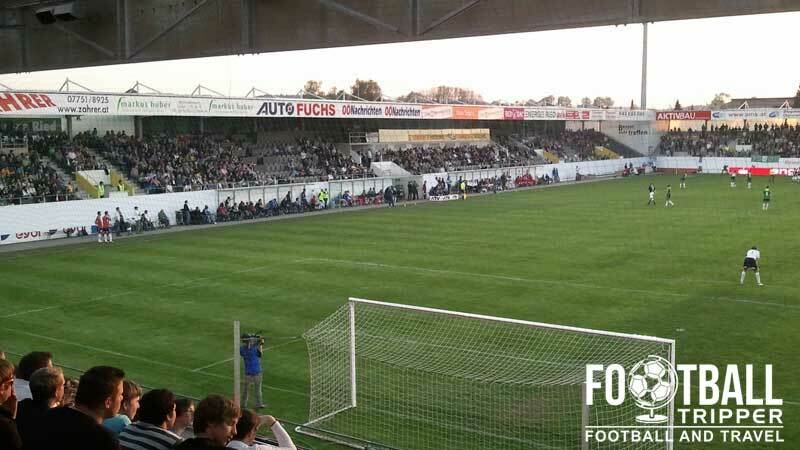 Keine Sorgen Arena formerly known as Fill Metallbau Stadion is a 7,680 capacity stadium located in the Upper Austrian city of Ried im Innkreis. Home to SV Ried, the stadiums name literally translates as “No Worries Arena” which is the main slogan of an insurance company. The Keine Sorgen Arena first opened in 2003 when it replaced SV Ried’s former home of Rieder Stadium with the old ground relegated for usage by the reserve and youth teams as well as for athletic events due to the existence of the problematic running track around the perimeter of the pitch. With better views of the footballing action and a much improved capacity compared to the 1,100 seats at former stadion, fans of the club were very positive about the team’s move to the new facilities. As all four stands are currently covered by roofing, and all footballing facilities are up to the standard of the most European stadiums, changes to the ground since opening have been very limited and largely unnoticeable. The expansion of the VIP area in 2013 to accommodate over 500 seats for management, sponsors, more affluent fans and journalists is probably the most significant change to the arena with the addition of fibre optic broadband not used by the regular paying supporters. Similarly, the installation of under-soil heating in the Summer of 2013 didn’t represent a cosmetic change to the facilities unless you pedantically wanted to argue that the pitch looks better in the winter months as a result of the equipment. With one of the smallest budgets in the league, fans shouldn’t expect any major renovations in the near future unless the club were to qualify for a major European competition. 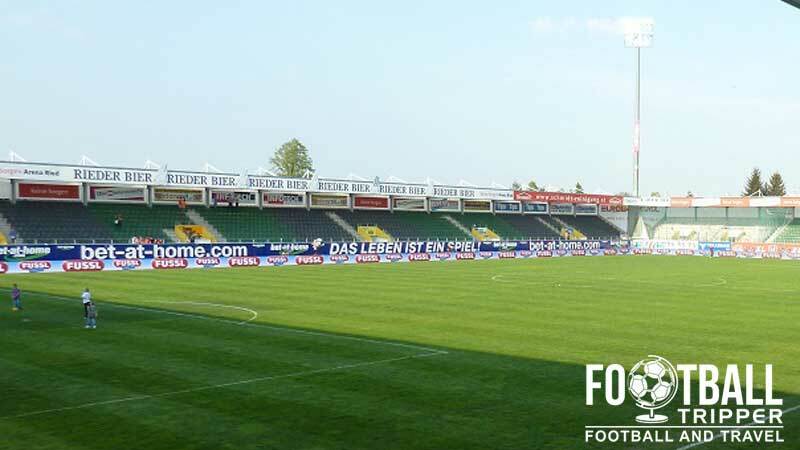 Lastly, The Keine-Sorgen Arena was formerly known as both the HomeLife-Arena and the Fill Metallbau Stadion when it first opened, with SV Ried always opting to sell the naming rights of the stadion to sponsors in order to maximise revenue. Currently the club is sponsored by the Upper Austrian Insurance company whose catchphrase of “No Worries” or Keine Sorgen is used for the name of the stadium. Kiene Sorgen Arena is comprised of the four stands: North, East, South and West. Away fans are housed within the north section of the eastern goal-end as highlighted on the above seating plan with the colour grey. SV Ried sell official merchandise from their fan shop at Keine Sorgen Arena in addition to the club’s online store. SV Ried’s club shop is of course open on matchdays, usually for at least a few hours before kick-off. 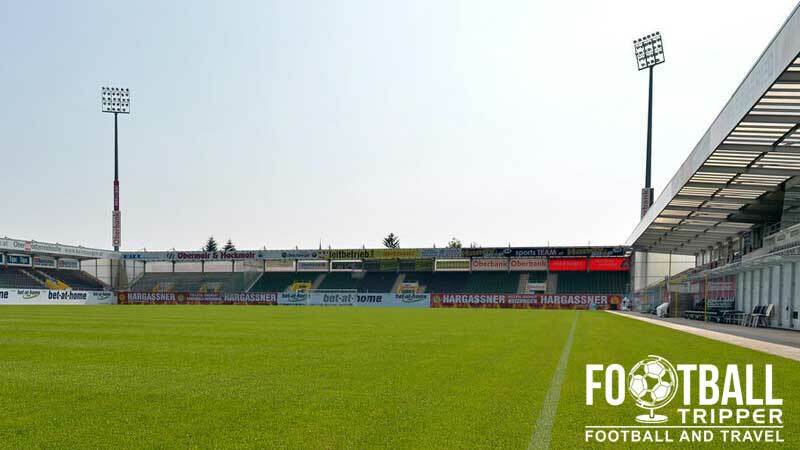 Sadly it doesn’t seem as if SV Ried offer guided stadium tours of Keine Sorgen Arena right now. Should this change we’ll be sure to update his section. 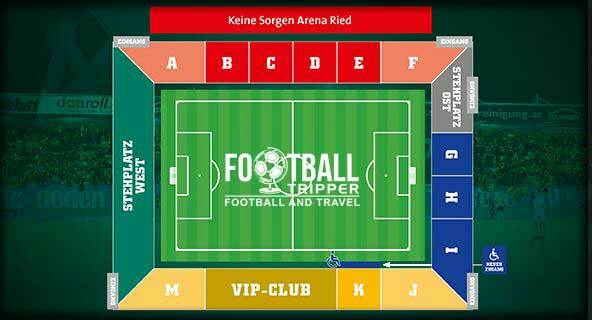 Tickets to see SV Ried can be purchased through the usual Austrian Channels including online from the official website, the club shop/office during the week and at the various ticket sales points around the ground on matchdays. Keine Sorgen Arena is located approximately 1.4 km west of Ried’s historical town centre and a similar distance from the main railway station. Most Football Trippers can easily walk to SV Ried’s stadium in 20 minutes thanks to the compact nature of the the town centre. There is a moderate amount of parking available on site at the ground although the exact matchday parking arrangements remains unclear. Ried im Innkreis railway station is situated 1.9 km or so south of Keine Sorgen Arena, with the next station along “Ried im Innkreis Bad” only 500 metres away. Due to the small size of the town and walk able nature of the stadium riding the train for one stop does seem slightly excessive! East of SV Ried’s stadion along Brucknerstraße there is a bus station which is served by bus numbers 850, 851, 862, 863 and 866. The two closest major airports to the town of Ried Im Innkreis are Linz Aiport (64 km) and Salzburg Airport W.A. Mozart (74 km). Hotel Ried next to the river is less than five minutes away, three stars and reasonably priced which makes it hard to beat in a small town with a limited range of accommodation options.